What's that saying—if life gives you lemons, make lemonade? Well, how about when decades of destroying the environment gives you a cancer-causing smog problem, make it part of your national defense strategy? China is doing its best to look on the bright side of a very dark situation. 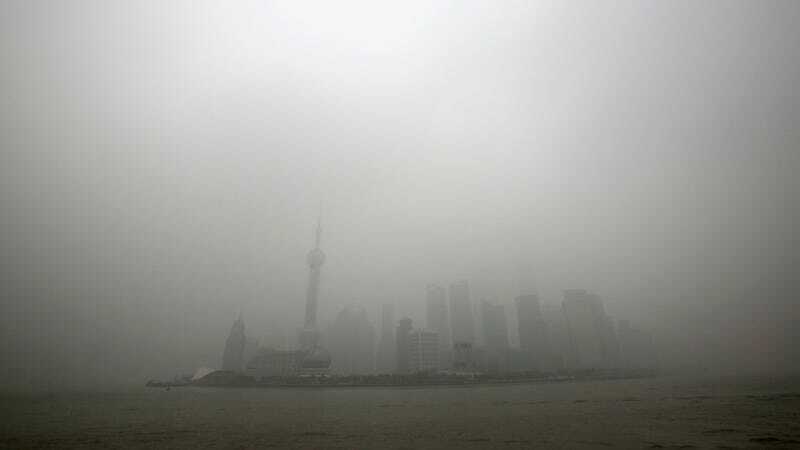 The Communist Party-affiliated Global Times newspaper recently put a positive spin on the relentless clouds of smog that have been clogging the air of Chinese cities for the past few years. The paper said in a report this week, "Smog may affect people's health and daily lives, but on the battlefield, it can serve as a defensive advantage in military operations." The idea, of course, is that if the smog is thick enough to be seen from space, it's also thick enough to keep pesky Capitalists from aiming their missiles appropriately. Missile guidance, infrared rays, and lasers could all be hindered by the blanket of smog, the paper reported, pointing out that soldiers from the Federal Republic of Yugoslovia used smoke from burning tires to hamper NATO air strikes during the Kosovo War. Yet, as our friends at Gawker pointed out, the Federal Republic of Yugoslovia does not exist anymore because NATO found a way through the smoke and mirrors after all (although it probably did have the effect of misdirecting some bombs and thus killing some civilians).